Until recent times it was believed that the Italian Romanesque painting was strongly influenced by Byzantine styles. Several galleries and museums of many Italian cities house numerous wooden icons painted in Constantinople or copies made by local artists following the types established by Byzantium. But there are some icons with such a strong Italian character that almost announce the Renaissance. This is particular for the frescoes, where the stylistic independence from the Byzantine rules is clear. Interior of the abbey of Sant’Angelo in Formis (Capua, southern Italy) from the eleventh century. The painting decoration of Sant’Angelo displays a mixture of Byzantine (Eastern) and Latin (Western) styles. The frescoes were painted by Greek artists and by their Italian pupils. Only the frescoes produced by the Benedictine school, formed during the restoration of the Montecassino abbey, still remained influenced by the Byzantine art. The paintings from Sant’Angelo in Formis, the crypt of the cathedral of Anagni, and the monastery of Subiaco are prime examples of this Benedictine school. Especially, the church of Sant’Angelo in Formis, near Capua, has walls entirely frescoed with such singular beauty that could be qualified as modern despite its Byzantine iconography. 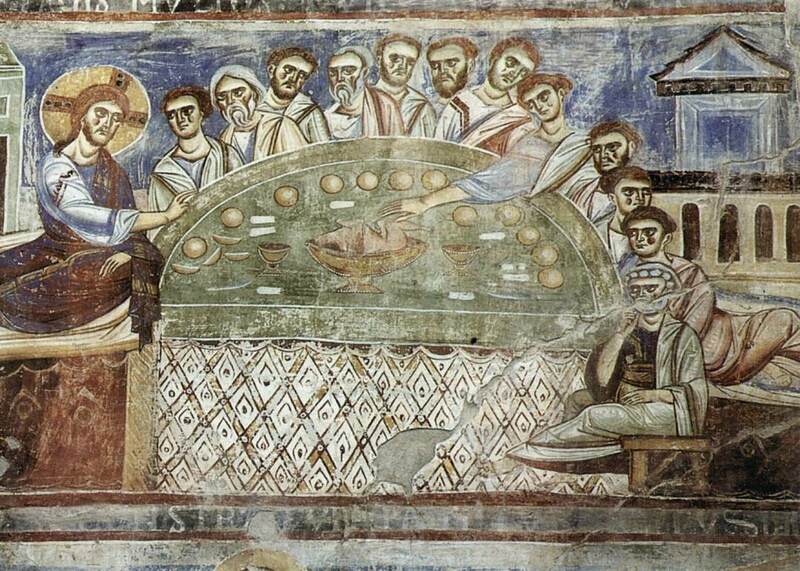 In the crypt of the cathedral of Anagni, in addition to common themes from the Byzantine repertoire, there are unique representations of the Arts and of Hippocrates and Galen, which clearly shows the interest in ancient authors and the influence of the neighboring school of Salerno. Some of the frescoes of the abbey of Sant’Angelo in formis: top left, Christ in Majesty; top right, Angel of the Last Judgment; second row left, Last Judgment detail; second row right, Archangel Michael, detail of the apse’s fresco; third row, last super; last row, Christ Healing the Blind. All frescoes from ca. 1080. The irreparable loss of many of these Romanesque frescoes and icons, particularly in a period when the Italian art was developing, makes more interesting the study of what has been preserved of the Romanesque Italian painting in the form of the miniatures drawn to illuminate ancient manuscripts. These miniatures illustrate the thinking and feeling of Italian peoples during those transitional times. The miniatures summarized all the artistic influences and tendencies of the time; books were imported from distant countries, and were an open form to introduce ways and styles that would be risky to adopt in architecture and sculpture. Interior of the Anagni Cathedral (Anagni, Lazio, Italy). It was famous for being the summer residence of the Popes for centuries. This cathedral was built during 1071–1105, with some Gothic additions in the mid-13th century. The frescoes covering all its walls and ceiling are among the best preserved examples of Romanesque art in Italy, and form a single iconographic scheme including natural philosophy, saints, the Apocalypse, and the Old Testament Ark of the Covenant. The Cosmati style floor remains in excellent condition. Some of the Romanesque frescoes of the Anagni cathedral: top, scene from the Ark of the Covenant; second row, Persecution of St. John the Evangelist by the Emperor Domitian; third row, a Seraphim; bottom row, frescoes at the ceiling with Mary in first term. Interior of the Monastery of St. Benedict at Subiaco also known as the Abbey of St. Scholastica, (Subiaco, Province of Rome, Region of Lazio, Italy). However, two big centers of book production from Romanesque Italy stand out clearly enough to help distinguish the manuscripts preserved today in libraries. One of this book production centers was Rome, whose manuscripts are most probably concentrated at the Pontifical Library. The codices executed in Rome and Lazio have figures delineated with thick lines, though firmly drawn. The backgrounds were filled with solid colors, sometimes subdivided into horizontal zones. The colors were transparent and varied, and the vignettes represented scenes full of life. The second school of Romanesque Italian miniature is that of Montecassino. Before Cluny organized the Benedictine Order as a monastic empire by bringing together most of the Western religious houses of the time, the Montecassino abbey, with nothing more than its prestige of being the place where St. Benedict lived, died, and was buried, was the monastery to which other Benedictine houses throughout Europe came to find advice and direction. Before the abbacy of Desiderio, the books produced in Montecassino were characterized by its almost geometric decoration with profusion of intertwined traces and with zoomorphic features reminiscent of Teutonic and Celtic styles. Above, some examples of the Romanesque frescoes decorating the interior of the St. Benedict at Subiaco. It was in one of the so-called industrial arts in which can be better appreciated the emancipation experienced by painting and sculpture during the Romanesque period in Italy, i.e. the Romanesque bronze doors of several Italian cathedrals. The origin of bronze forging and assembling techniques is purely Byzantine in origin. These doors were decorated with storied compositions made in relief and framed within rectangular panels forming the whole door’s bronze armature. In these decorated squares it is clear the Latin style of representing personal and individual scenes, contrary to what is seen in the formal Byzantine artistic protocol. Among all these bronze doors, the most famous are the doors of San Zeno of Verona (with elements from the XI century) and the wonderful Porta Ranieri, located near the apse of the Pisa Cathedral, a work of Bonannus. In the reliefs of these bronze doors there is a “premonition” of the work that Ghiberti will later execute for the baptistery of Florence. The excellence of these bronze doors from Southern Italy was well recognized by Nordic nations, who saw in those gates an artistic event that anticipated their own times. the bronze doors cast in Romanesque Italy were widely imitated in Germany. The Codex Benedictus, an eleventh-century Romanesque lectionary produced in the scriptorium of the Abbey of Monte Cassino. Detail of the bronze doors from the Basilica of San Zeno of Verona, Northern Italy. The “Porta di San Ranieri”. It was cast by Bonanno Pisano at the end of the XIIth century. This door miraculously survived the fire of 1595, in consequence, the original is now preserved in the Museo dell’Opera del Duomo in Pisa. In the original place of the door, at the transept of the cathedral of Pisa, there is now a copy. Below, details from the Porta Ranieri: top left, Triumphal entry into Jerusalem; top right, The Raising of Lazarus; bottom left, The Cavalcade of the Maggi with the original sin below; bottom right, The Annunciation (Museo dell’Opera del Duomo, Pisa, Italy). Posted on March 19, 2016 October 28, 2016 by carolinarhPosted in Romanesque ArtTagged Benedictine school of painting, Frescoes, Illuminated Codices, illuminated manuscripts, Industrial Arts, Italian Romanesque art, Italian Romanesque painting, miniatures, Porta Ranieri.